Although it is spring, there still remains a chill in the air here in Pittsburgh. As a way to cope with this roller coaster weather, I make comfort food—and one of the comfort foods I serve for dinner is potato cheddar soup. This is a hardy soup– equally filling and delicious. In a large soup pot, melt butter. Add in chopped onion, carrot and celery. Stir and cook until onion is translucent. Add in garlic and cook another 2 minutes. Add in peeled potatoes and give the pot a good stir. Add in seasonings of salt, pepper, parsley and Italian seasoning. Pour broth and bring to a boil. Turn down to a simmer and cover. Cook until vegetables are tender about 40 minutes. Using a potato masher, mash up vegetables in soup. Add more broth if consistency is too thick. 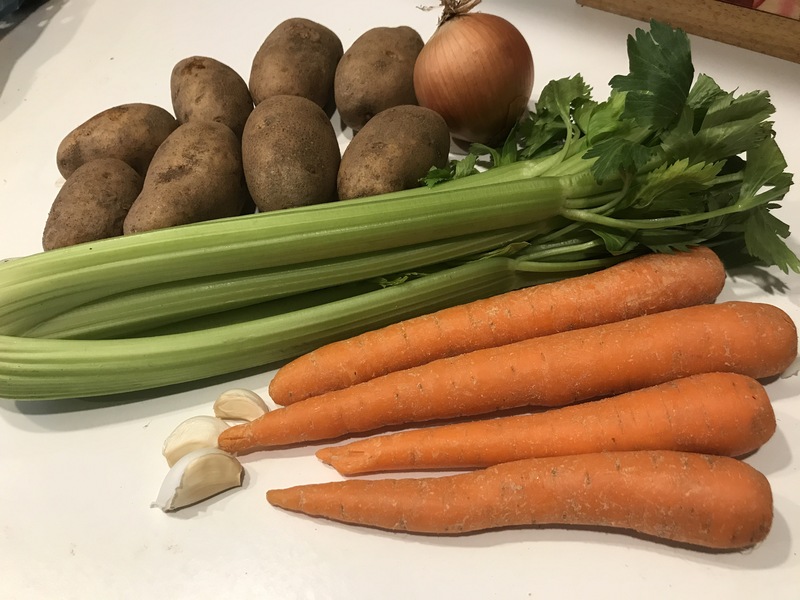 The soup is ready to be served here, or you can add the following step to make it a cheese and potato soup. Melt butter in a sauce pan and add in flour. Whisk together until the consistency of glue. Add in half and half and milk. Stir constantly until cream sauce beings to boil. turn down heat and stir until thick. Remove from heat and add in cheddar cheese. Add cheese sauce to large soup pot. Stir until completely combined with potato soup. Serve with a dollop of sour cream and green onions if desired. I pair soup with a salad and broiled bread. To add a bit of pizazz to the salad, I top it with dried cranberries and dried mangoes. This is a delicious meal for a cold and rainy day. Satisfying and comforting! I make the broiled bread using a freshly bought, whole loaf (not sliced) Italian bread. I slice and butter the bread with Kerrygold Butter and broil in the oven for 2 minutes. The bread is so delicious on its own, or when dunked in the soup. Enjoy!